Hello and welcome to our section on patio swings. This area of the site is all about the best of the best when it comes to outdoor relaxation and enjoyment. We have searched far and wide, finding ourselves in some very elegant backyards looking for what’s out there. We have found that there is a style and material for just about everyone. Patio swings are relaxing and comforting. Most people enjoy a gentle rocking motion that puts us right to sleep, like babies being rocked! By adding a swing to your outdoor living space, you are creating the perfectly relaxing (and romantic!) atmosphere to enjoy morning coffee and a book, or to watch the sunset with your loved one, or gossip on the deck with your girlfriends. Some of these swings will be best for porch suspension; others will be best for suspending from trees. If you are looking for wooden swings, you’ll want to select slats will a rollback design for comfort. Woods like cypress and cedar emit natural chemicals that repel bugs, making them durable and impervious to bug-related damage. 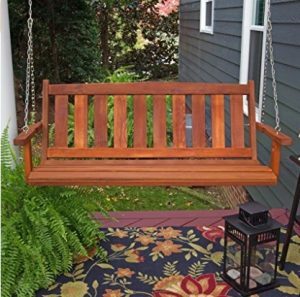 Patio swings can be made from all kinds of materials including fabric, wood or wicker. 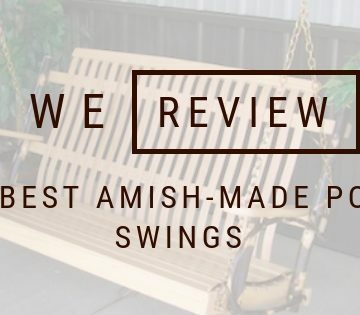 In our carefully curated category you will find a wide array of styles and makers to choose from all the way from some of the top reputable brands to Amish made furniture. 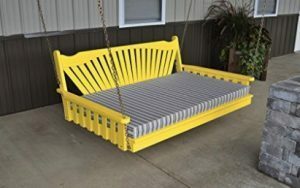 You’ll even find porch swing beds that are hung with galvanized steel chains and provide the perfect cozy spot for taking a lazy nap. Please note that these porch swings will require some assembly, but we have done the research. Everything listed comes with instructions and is pretty easy to assemble.